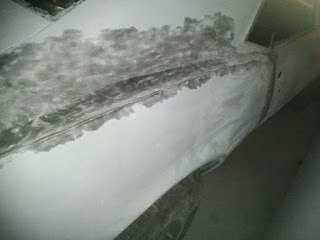 Even at the time of purchase, it was known the passenger side rear quarter panel had damage. Until the car was sanded to bare metal, it wasn't known how bad it was. 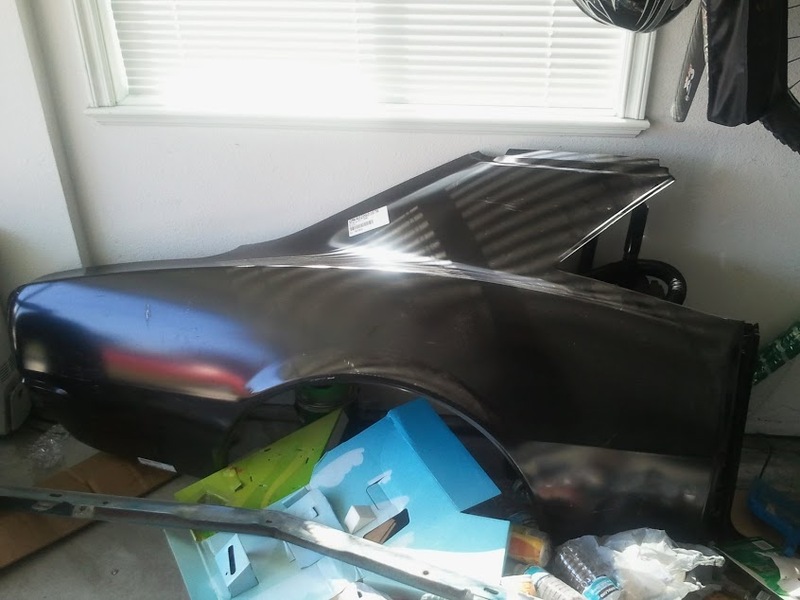 Unfortunately, the damage was likely the result of a collision and the previous owner spliced up a used panel and welded it on to the damaged one, then used a ton of Bondo to smooth out their mistake. Either way, the whole panel was compromised and needed replacement. A new panel was purchased for approximately $250US. The panel was compared to the original and clearly matched. new and the old. In this case, the old panel is fastened with a large number of spot welds everywhere but the top of the sail panel. The spot welds can be drilled out but that causes "swiss cheesing" of your connecting panels. 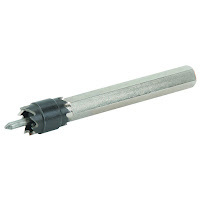 Instead of a standard drill bit, you best to use a Spot Weld Cutter. It's like a drill bit with a circular cutter around it. It allows you to cut around the spot weld just enough to free the panel, while leaving the underlying metal undamaged. For a panel if this size you'll probably need at least one high quality cutter or 2-3 cheap ones. The top of the sail panel was attached with a seam of lead weld. The best way to detach this portion of the panel is to use a blow torch to heat up the led and pull it apart. Be very careful as lead can be dangerous to handle with your hands and even more dangerous to breath in. In other words, consider gloves and a mask or you could die. You don't need to cut the panel apart like in the provided pictures, but it can help to take a look at all the mounting points from the other side. In this case, it was done as a combination of fun, and curiosity. They make for interesting pictures at least. Once you have the old panel completely removed, consider coating the bare metal of neighboring panels with paint. Paint, or a more expensive specialty coating, will help protect the metal and prevent rust. Take the new panel and line it up on the car. You'll want to ensure all parts of the panel are lined up before making any welds. The door jam area has the clearest body line and could be lined up first, then look at the trunk weatherstripping area and rear bumper. The rest of the panel should follow suit. It can be difficult to hold the panel on the car while fine tuning the alignment. You can use rope, wire or even fabric tie down straps wrapped around the entire vehicle to keep the panel in position for this process. Once you have exactly where you want it, you can weld a few spots to hold it there, and then continue adding spot welds to the rest of the panel. Instead of new lead, a welded seam was done across the sail panel. Once you've got the panel welded on, you'll want to give it a quick scuff, clean and apply some primer. The exposed welds will rust very quickly and you'd be better off to do a quick prime than to leave it to the elements. 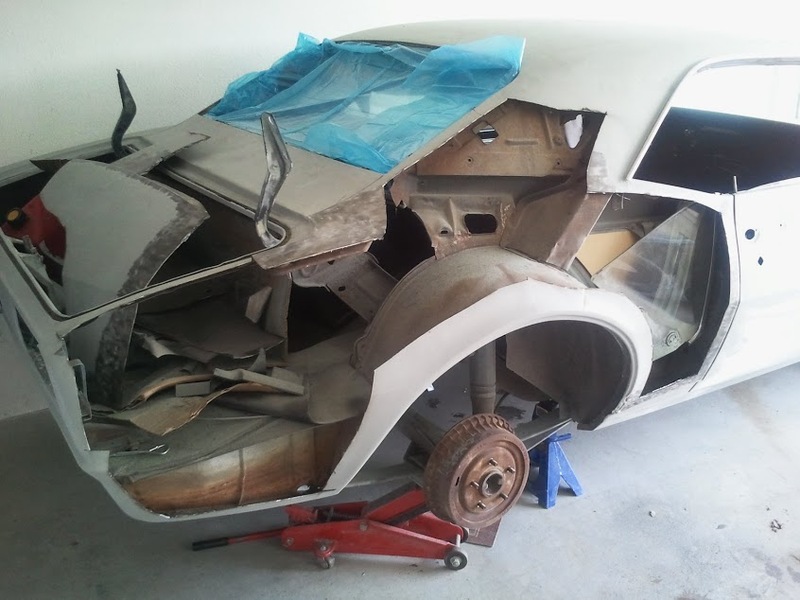 Overall replacing body panels isn't difficult if you have the time and the tools. Patience is probably the most important aspect as if you rush lining up the panel you'll end up with it lop sided and it could be a costly mistake to fix. Do it slowly, do it ducimo.